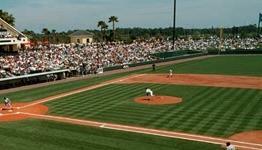 The Braves have a very attractive park similar to Legend's Field that is located at the gigantic Disney's Wide World of Sports Complex. Sure, its 9,500 seating capacity isn't exactly "cozy," but the cleanliness and atmosphere of this park make up for it. It has a huge lawn area along the 3rd base line and an outfield that is great for families with kids. Furthermore, the open concourse ensures that you will never miss any action while walking about or grabbing a bite. This park is strikingly similar to the Texas Rangers' Ballpark in Arlington right down to the green support beams. It looks like an "old-time" stadium, but in reality it is fairly new. Great concessions are availble at the game, and the Official All-Star Cafe (please see restaurant section for more details) is located right next to the stadium. The popular lawn area is located on the left side of the park. Be sure to get your tickets early to games at the Wide World of Sports, because the hot Atlanta Braves always sell out quickly. As you look at the outside of the stadium, you can definitely see that is was designed in the vintage fashion that started to become popular in the mid nineties when the new Camden Yards and Ballpark in Arlington were built. Autograph tip: batting cages are located behind left-center field near the lawn, so it is easy to get a few signatures as players take their swings. Catcher Charles Johnson, who was at the cages, signed for the entire duration of an extremely long rain delay when I visited.